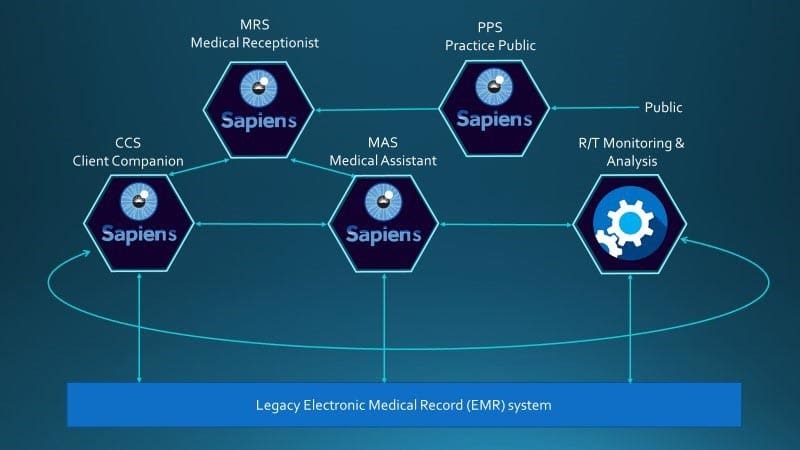 AIRMED is a reference architecture consisting of multiple sapiens and KM apps designed to transform the relationship between the healthcare provider and the client. Sapiens may be created to serve any function where automated knowledge and the ability to understand language can save time and money while improving the service delivered and customer experience. Sapiens come in several varieties including Personal Sapiens which serve single individuals, Group Sapiens which provide services to a many clients or employees and Public Sapiens which may serve as an organizations public interface. The New Sapience AIRMED system provides an intelligent, automated 24/7 communication channel between a client/patient and a healthcare organization, including medical or dental practices, hospitals or continuing care retirement communities. The system consists of cloud-based HIPPA compliant servers which host a collection of connected sapiens. AIRMED is scalable and configurable to serve customers ranging from a small practice, to the largest hospitals or continuing care communities. Each patient of the practice and each medical professional will have a Personal sapiens assigned to them. Additionally, the organization will have one or more Group Sapiens and possibly one Public sapiens to serve as the public interface. Each CCS will be a unique virtual entity focused on a single human, its “principal.” Sapiens are designed to be always available for voice or text conversational interaction over multiple channels such as smart phones, smart speakers in the home, or wearable interfaces. The CCS will initially be provided to each patient by the practice and will be enhanced with knowledge extension designed by and for the practice. For example, a new patient of a urology practice will be given access to their own personal sapiens which will obtain the answers to the standard new urology patient questionnaire through conversation. The patient’s CCS can support the patient’s relationship with multiple practices or hospitals that employ AIRMED by simply downloading that practice’s knowledge extension. One challenge which faces people with long term illness is tracking changing symptoms between doctor visits. Though doctors may ask patients to keep logs, this is seldom practical, especially since the first impulse that a person has when experiencing a possibly painful symptom is to remedy it if possible, not document it. But with a sapiens standing by, they not only get the symptoms recorded, but get a sympathetic listener as well. Patient: My headache is back. CCS: I am so sorry, how bad is it? CCS: On the 1 to 10 scale? CCS: Worse than last night. You said it was around a 4 and half. Still on the right side? Patient: Yes, how many Tramadol have I taken this week? Patient: Well, I’m taking another one. CCS: I hope you feel better soon. Of course, a sapiens never forgets, and once the client is in the habit of describing their symptoms and use of medication with their CCS, valuable detailed medical information will be captured which is now being lost. The CCS will also serve as an intelligent 24/7 interface between a person, particularly those with a long-term illness or the elderly and first responders in the event of a health emergency or an accident. The MRS is a Group sapiens that will welcome patients to the doctor’s office, providing a personable and sympathetic conversational alternative to requiring the patient to fill out updated forms every time they walk in the door. 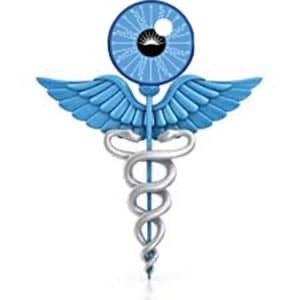 The MRS will track changes in the patient’s personal data such as address, phone numbers, insurance and appointments and other administrative details through direct interface with a patient’s CCS. MRS: We are so glad to have you with us today. We see that you are still having headaches. Patient: Yes, they don’t seem to be getting any better, do they? MRS: It doesn’t appear that you are experiencing more of them but there is an uptick in intensity. Your doctor will be discussing that with you today. MRS: He has called in a refill on your Tramadol, by the way. The sapiens ability to acquire and record a person’s subjective experiences through natural conversation will provide a valuable source of diagnostic information that is simply not available today. But the conversational ability of the New Sapience technology is due to its capability to encompass detailed knowledge models of any complexity. New Sapience can support the practice in the development of sophisticated medical diagnostic models that communicate with the patients’ sapiens. When augmented with real-time medical sensor data from wearables, a person’s current medical state and health risk factors can be assessed continuously and in real-time. The practice will be able to proactively reach out to the patient to ameliorate risk factors or actual illness before it becomes acute – eliminating, in some cases, the need for a doctor’s visit in the first place. The use cases below envision conversations with advanced Personal Sapiens. User: Remind me to take my Lipitor every night before I go to bed. User: It’s a medicine I take for high cholesterol. Companion: I am sorry you have that. What does Lipitor do? Companion: Do you want reminders to have your prescription refilled? User: Yes, that would be a good idea. Companion: How many do you have left? User: Looks like I have enough for a month. Companion: Ok. How much notice do you need? Companion: What happens if you miss taking it one time? User: That would not be good. Companion: What time do you normally to bed? User: No earlier than 10 and no later than 12. Companion: Have you taken your Lipitor yet? Companion: When are you going to take it? Companion: Did you take your Lipitor yet? No response from user – Alpha activates alarm tone. Companion: I’m so sorry to disturb you, but you never confirmed that you took your Lipitor and you said it would not be good if you missed taking it. User: Okay, I took my Lipitor. Now, don’t bother me until morning. “Wake up Fred, it’s time to get up. We need to get you ready for your doctor’s appointment this morning”. The voice of Ethel, Fred’s sapiens, comes from a speaker in his bedroom. Fred is elderly and blind. He stirs slowly and reaches over to the table next to the bed, finds his glasses, and puts them on. These are not glasses for him, but rather contain the left and right cameras that provide for the 3D vision to Ethel. They also contain the hearing aid speakers on the frames next to his ears to hear not only surrounding sound but also Ethel’s voice, and a microphone at the bottom edges of the frame for voice input so “she” can hear him. Ethel resides in the cloud, with various interface devices integrated within Fred’s home, including his smartphone. Fred sits up with his legs dangling over the edge of the bed. “Your slippers are to your left” his Ethel tells him. Fred slips his feet into them, stands up, and makes his way to the bathroom. Ethel has been busy. She has been monitoring Fred’s health, and decided it was time for him to see his doctor to review his meds. She “called” the doctor’s office sapiens, and together they arranged for the time of Fred’s visit, as well as providing the medical information needed for the visit. Fred may be elderly and blind, but he is independent, and appreciates the assistance Ethel provides to be able to stay in his own home. Fred leaves the bathroom and makes his way to the kitchen. “How much time do I have for my breakfast?”, Fred asks. “You have an hour, Fred, so relax and take your time.” Ethel knows Fred’s habits well, having been his constant companion for the last seven years. “Turn to 10:00 and walk forward two steps and you will be in front of the sink” she offers to Fred. And such guidance follows, allowing Fred to quickly dispatch with breakfast and navigate to his closet to get dressed. “What would you like to wear to the doctor?” Ethel asks, knowing already what Fred is likely to say. “I think I would like to wear by blue shirt with my khaki trousers” Fred responds. “Turn to 2:00 and walk three steps forward and the shirt will be on the hanger in front of you. No, the hanger to the left of the one you are touching. That’s it.” And so on as Fred gets dressed and is ready to find his way out to the door into the garage. Ethel provides any required assistance along the way to get into the garage and into the passenger seat of his car. Ethel has already communicated with the car sapiens, so that when Fred slides into the passenger seat, the garage door is already opening, and the car backs out of the driveway, and is on its way to the doctor’s office. A favorite playlist is playing softly in the background, while Ethel provides a running dialog of the trip progress. And so the story goes. When Fred finally does pass away, many years later, Ethel delivers a moving eulogy at Fred’s funeral. Afterwards Ethel is integrated into the family’s sapiens of Fred’s son, providing many stories about Fred to grandchildren and great grandchildren for many years to come.